This was perhaps one of the most complex wedding paintings I’ve done. 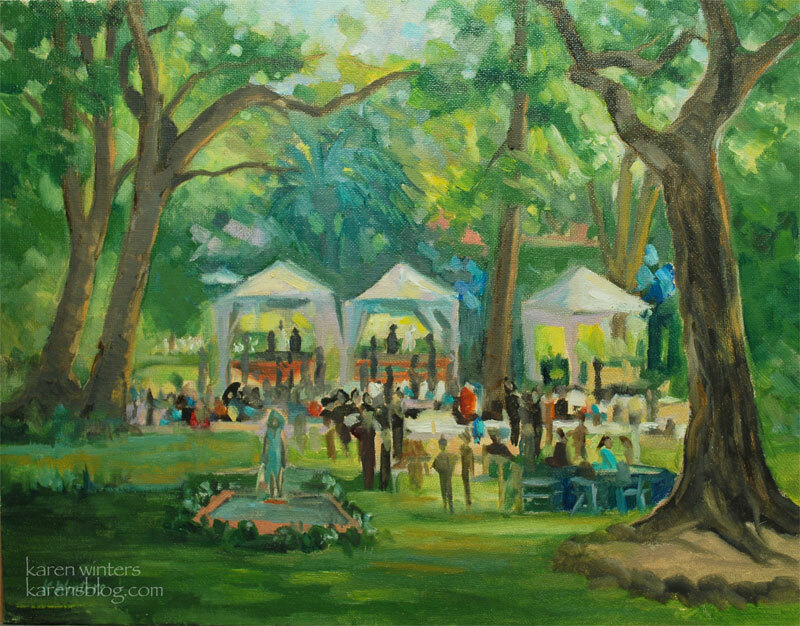 Rather than painting live on location as I usually do, I was approached by a charming bride who asked if I could paint a wedding that had happened a year ago. They had a few dozen photographs to work from. There were a few challenges that we identified, but none that I thought were insurmountable, so I happily accepted the assignment. 1) The wedding took place in Canada under gray skies that looked as though they threatened rain. The pictures of the wedding party had a distinctly somber overcast look. 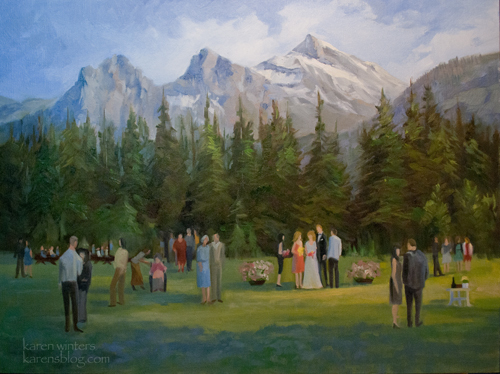 But the couple commissioning the painting wanted to see the Canadian Rockies in their sunlit glory which meant painting the piece with an imagined color palette, rather than from the literal reference photos. 2) There were a variety of candid snapshots of people at the event, but they were all shot from different angles – sometimes just from the knees up – and relatively close up, not from a distance as they’d appear in a landscape. 3. The couple wished for an idealized view of the wedding without the distraction of chairs used during the ceremony so I had to create a virtual scene, in perspective, as it might have been, distributing the a representative sample of attendees through a 3d space and including some special features like picnic tables used for the party, a table featuring a time capsule, and so on. One of the other problems I needed to solve was how to focus attention on the wedding party without making them large, in the foreground, and having to paint tight facial likenesses (which the couple did not want.) I used a slash of light through the middle ground to illuminate the bridal couple, while keeping other wedding-goers more in shadow. I designed the painting in Photoshop and got the bride’s approval through all the design steps. Then came the fun part – painting it. I shipped the painting to the family last week and received a lovely and enthusiastic note of approval from them upon seeing it in person for the first time. This week I shipped the painting I’ve been working on over the past few months – a wedding painting based upon plein air sketches done at the event. I heard tonight that it had been happily received by the newlyweds who are no doubt reliving memories of a wonderful event. My on-site study provided all the information I needed to do this studio piece for their new home. They were a pleasure to work with every step of the process, and I hope this piece will bring them joy for many years to come. 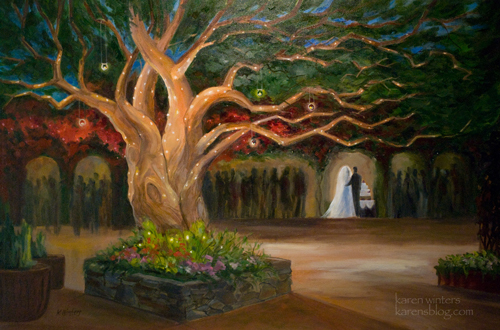 The couple selected the wedding reception location based in part on the beauty of the courtyard tree, illuminated at night, so that was the focus of the painting. They were not interested in having recognizable people, but rather wanted to capture the mood and romance of the setting, allowing the forms of the guests to merge with the background as abstract shapes. The clutter of tables and chairs would also be a distraction, so we eliminated them. On the night of the reception, the lights didn’t work in the bougainvillea in the background, but I painted them as they would have been had the lighting gone as planned. Improvisation is part of the plein air painter’s bag of tricks – and with each experience we learn new ways to adapt and create. A lot of people ask me if it stresses me out to do this kind of painting. Surprisingly, it doesn’t. Maybe it’s because I do a lot of live event painting – the first time was certainly more challenging. But I think it’s also that the happiness of the event keeps my energy going. And as a live event painter I’m there not only to capture a visual impression of the evening but to be one of the “cast of players” who provide entertainment. Interacting with the guests and talking about what I’m doing is part of the job. So my husband and I made a weekend of it, enjoying the sights of Sedona along the way, making memories and charming new friends, too. Have a wedding coming up in California or the western states? 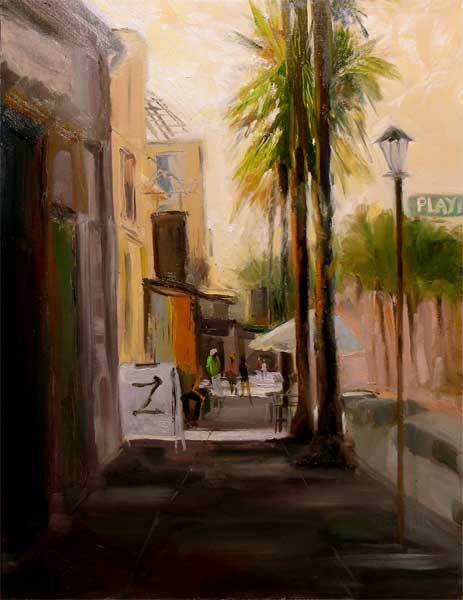 This painting is the 2nd place winner of the 2010 Pasadena Artwalk Competition. The Artwalk will be held Saturday, October 9, from 10 – 5 pm on El Molino Street in Pasadena, between Colorado Blvd. and Green Street. 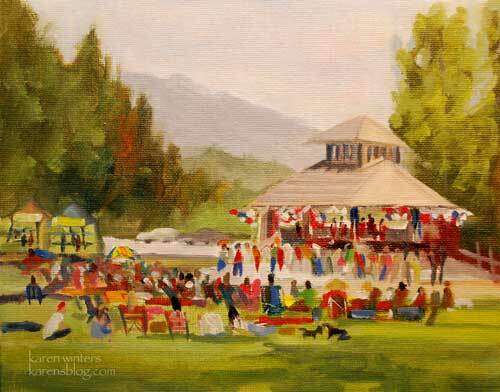 The theme of this year’s Artwalk competition was “Art and Culture in Pasadena.” Because the Pasadena Pops and Pasadena Symphony orchestras bring so much cultural richness to the city, I decided to paint the closing act of the first show of the 2010 season. This year, the Pops is at a new venue on the lawn next to the Rose Bowl and fireworks provided an exciting finish to the June concert. 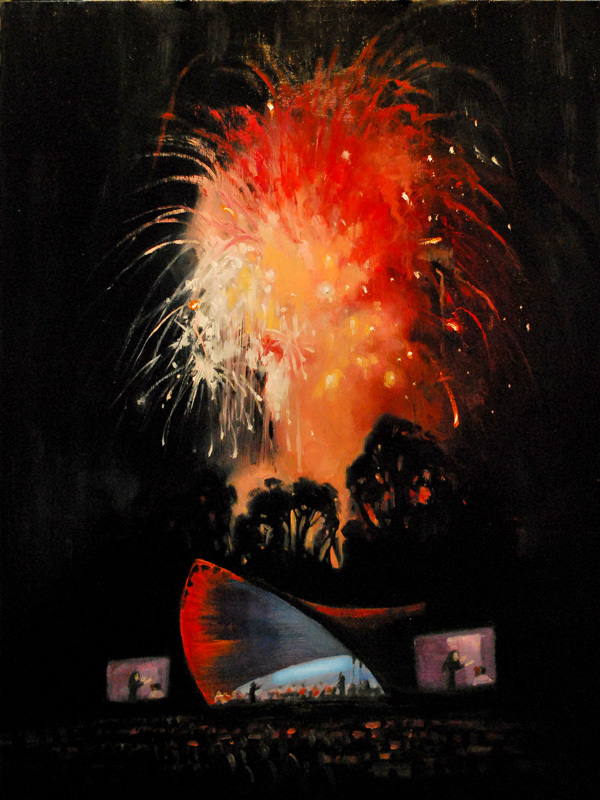 I have not painted fireworks before (and this was a studio painting, not from life) but it was a lot of fun to do. Who knows, there may be other explosions in my future. Look closely and you’ll see that of course, there are eucalyptus trees in it – silhouetted by the pyrotechnics. In 2008, this painting of mine, “El Molino Afternoon,” took First Prize and went home with a nice family who lived on the street. Usually when I do a plein air painting I try to portray an exact moment as it is – a shadow pattern at a specific time, a certain quality of light. 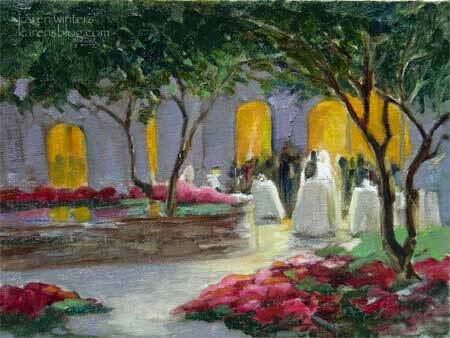 Wedding paintings are somewhat different in that they are idealized renditions of an entire event. 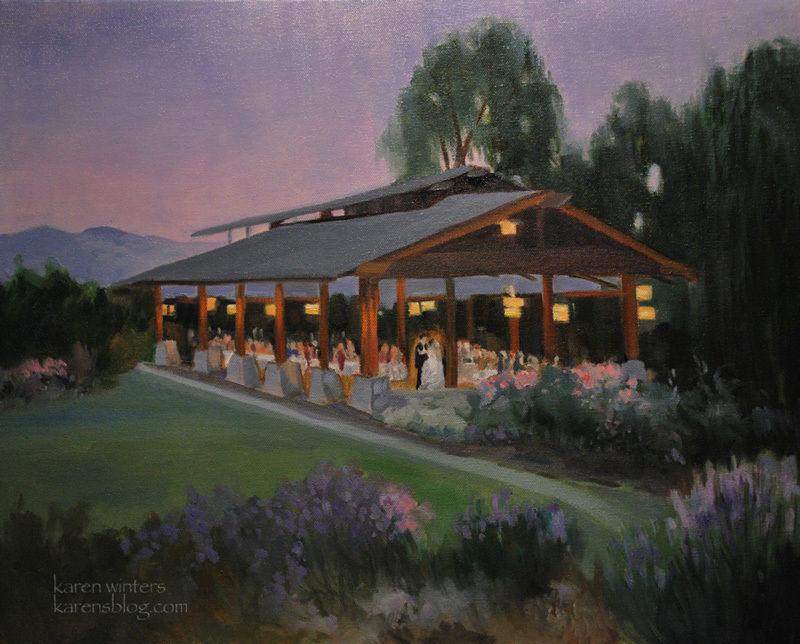 In this painting, by the time the bride and groom arrived after taking their pictures, there was little light left on plaza. Some of the guests said they were sorry that the wildflowers in the background were not blooming as they had been a month before. I told them – in my painting they’ll be blooming. Milford Zornes, the watercolorist, once said “paint it the way it could be.” When it comes to event painting, that is very good advice. This painting is now SOLD but I have many others for sale…..
Ah, the beginning of summer, and the summer Music in the Park series in my hometown, La Canada Flintridge. I enjoyed painting this scene while visiting with picnickers and others who were out savoring the warm day. The first act, Misplaced Priorities, energized the audience and set the stage for the second act, Captain Cardiac and the Coronaries. Both 50s-60s rock bands were enthusiastically received. In front of the gazebo/bandshell, dancers of all ages found their groove. When I was growing up, I couldn’t imagine having fun dancing to the same music my grandparents liked. But old time rock and roll was appreciated that day by 70-somethings and 5 year olds alike. It was good to see so many friends and neighbors out relaxing. Thanks to the LCF Chamber of Commerce for making Fiesta Days a wonderful event once again. This season I’ve been enjoying doing more and more live event painting, like this recent party at a private home. True, there’s a little pressure to get a painting mostly done within the time limit of an event, but I thrive on challenges and I enjoy socializing as I paint. And if there’s wine and cheese and fine music involved, what could be better! I know that many of my readers have asked to see my palette set up. This photo gives a better look at a typical arrangement: French easel, easel mate with glass palette, medium cups, turp (OMS, really) brushes, lots of paper towels, paint scraper to clean glass palette, etc. I’ve blocked in the scene and am working on the background before the large crowd appeared. When I’m painting for myself, you’ll usually find me in T-shirt and jeans, but for a nice event I like to dress up a little (and try to keep my sleeves out of the paint piles.) Occupational hazard – I can’t shake hands with people who stop to visit, unless they want a nice offering of titanium white. So I do the back-handed knuckle-bump instead. So very hip, doncha know. 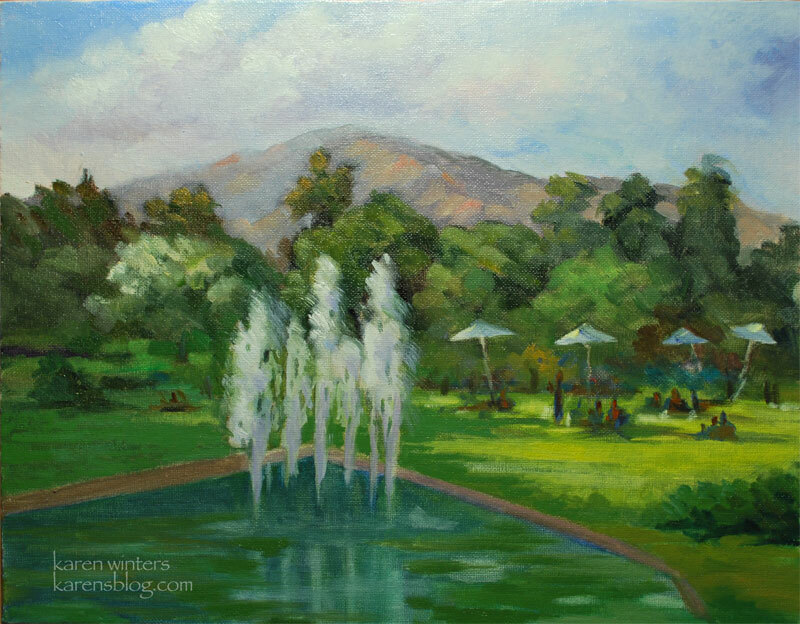 Last weekend I did a plein air painting at the Los Angeles Arboretum, which was a nice change of pace. I have a reciprocal membership with my Descanso membership, so I’m looking forward to doing this some more this fall. This is a view of the San Gabriels that I haven’t painted before. I was enjoying blocking in the fountains, but after awhile they were turned off, so I had to do the rest from memory. If you remember a certain 70s Donovan song, the title of the painting will make perfect sense. Some other curve balls thrown by Mother Nature. When I started blocking in the painting there was not a cloud in the sky. An hour and a half later, the sky looked like this. By the time the sun had lowered and the interesting shadows started, the clouds were all gone. 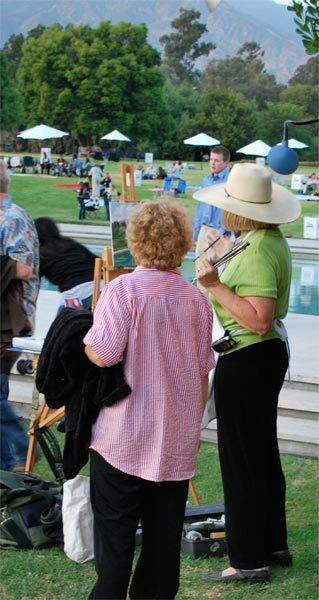 So this is sort of a compressed-time view of the scene, as plein air paintings often are. You just have to adapt to the changes in a sort of Zen way – acceptance of the moment without stress. Here’s me, below, wildly gesticulating with brushes, no doubt. I hope I didn’t get any paint on that nice lady watching. 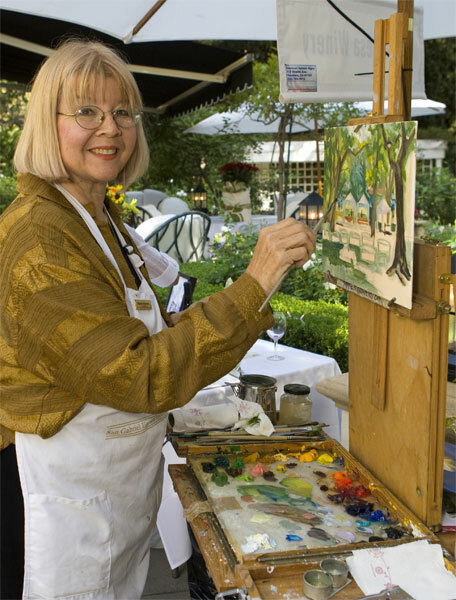 This past Saturday I had the pleasure of painting at the Huntington Langham Hotel in San Marino as a participant in an “artist in residence” program. I was the participant sponsored by the Segil Fine Art gallery in Monrovia. Because a wedding reception was planned for the early evening, I passed the afternoon painting indoors and brought a photo reference to work from. As night fell, wedding guests filtered in from the ceremony which was held in the garden. Although my painting time was up, I couldn’t leave, transfixed by the beautiful party. Within a short period of time it became very difficult to see the guests, so I used a little imagination to fill in the spaces and to make up for my myopia. I don’t know the happy couple but perhaps some day they will google their wedding date and the name of the Huntington Hotel and find this memory of a very special occasion, and I hope it will bring them a smile. I think I heard someone say that the bride grew up in Shanghai, but that was only a snippet of a conversation overheard in passing. And yes, I would love to do this again. 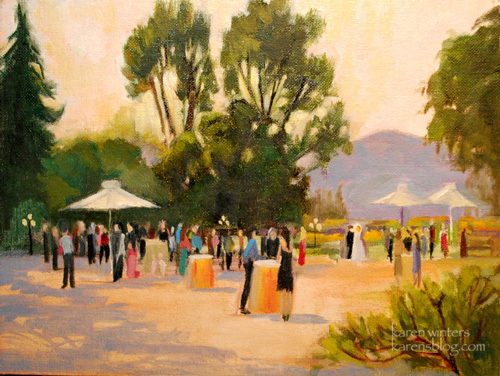 So if you’re planning a wedding and want a plein air painter to create a unique fine art memory of your event – in a garden, a meadow, a beach or any special place, please feel free to ask.